Learn how to make your own chocolate on a 2-hour workshop at the ChocoMuseo in ChocoMuseo Ollantaymbo, in the secret valley. This is a hands-on activity, starting from the cocoa tree to the finished product passing by every step of the whole chocolate-making process. Moreover, discover the history of cocoa and the reasons why Peru is known for its fine chocolates! Learn how to make chocolate through an interactive tour of the factory, the museum and the chocolate workshop. Professional guides will explain to you how to make chocolate from the bean to the bar. Understand the history behind the famous cocoa beans and how Peru got to make some of the finest chocolate around the world. 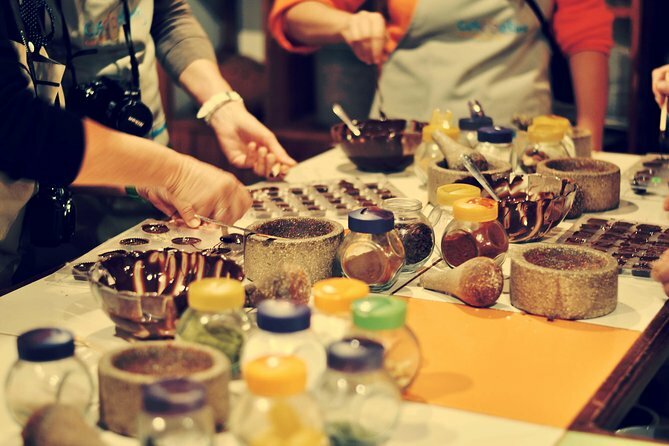 During the workshop, you will learn the different steps of the chocolate making process and participate to 4 of them: roasting the cocoa beans, removing cocoa husk, grinding the cocoa nibs on a metate with a mano, and refining the cocoa paste in a melangeur. You'll get to see our actual machines that produce the cacao licor for all our shops in Peru. Finally, you will prepare and savor delicious hot chocolates as well as creating your own chocolates with your choice of ingredients. You will be able to leave with all of your handmade chocolates unless, of course, you have already eaten them!